JT – We haven’t had a chance to chat since before the 2017 Formula One season begin with the Australian Grand Prix in Melbourne in late March. As always, the first race of the season offered opportunity for those willing seize it. Ferrari did just that, showing pace on par with Mercedes and taking the initiative with pit strategy during the race. Sebastian Vettel got away from the grid well, just behind pole-sitter Lewis Hamilton. He then trailed Hamilton closely, forcing the Mercedes driver to use his tires hard. Hamilton pitted on lap 17 but Vettel remained on track until Lap 22. Hamilton emerged from the pits behind Max Verstappen and was unable to pass the Red Bull Racing driver despite being on newer tires. The delay allowed Vettel to build a gap which saw him emerge from the pits well clear of Hamilton and he remained in front until the checkered flag. The result was a widely applauded surprise and a hopeful sign for the championship. Ferrari has certainly closed most of the performance gap to Mercedes. However, on-track passing was at a premium throughout the field. Very few passes were made even during the opening laps. What did you think of the Australian Grand Prix? SJ – Ferrari has certainly improved significantly over the winter and they proved it. Mercedes didn’t get their strategy quite right and they paid for it. More than that, Ferrari’s pace doesn’t seem to be a flash in the pan. They were quick in pre-season testing and they backed up the promise from the tests by being right on the pace when they arrived in Melbourne. If anything, it looks like their tire management may be the best in the field at the moment, at least with Vettel. That goes back to a conversation we had in the blog last year. At the time I said I’d bet that Ferrari would gain an advantage from Vettel’s willingness to be an integral part of all the tire testing Pirelli did in preparation for the new tire rule for 2017. He was the only driver to put aside the time to do that. I said at the time that I guarantee this would pay dividends for him going into 2017 and it certainly looks like it has. I can’t understand why no other driver was willing to do that. If there’s one simple way to gain an advantage, it’s in understanding the tires and even better if you can have an influence on how they are built. That was one of the main reasons why Michael Schumacher was so successful. He spent every day he could pounding around Fiorano when Ferrari was using Bridgestone and they came out with a tire absolutely tailor-made for his driving style. Hardly anyone else could make the tire work but it suited him perfectly. Every tire company always develop a kind of philosophy on how they build their tires for a certain type of car or series and if you can have an influence on that philosophy – if you can affect and learn the nuances of the construction they use – it makes a huge difference. You gain just that little bit more confidence in being able attack a fraction harder on corner entry. That affects the performance through the whole corner, the way you set the car up and everything. It might be minuscule gains but that can be all the difference you need to win. Good for Vettel and shame on everybody else for not committing to that testing. 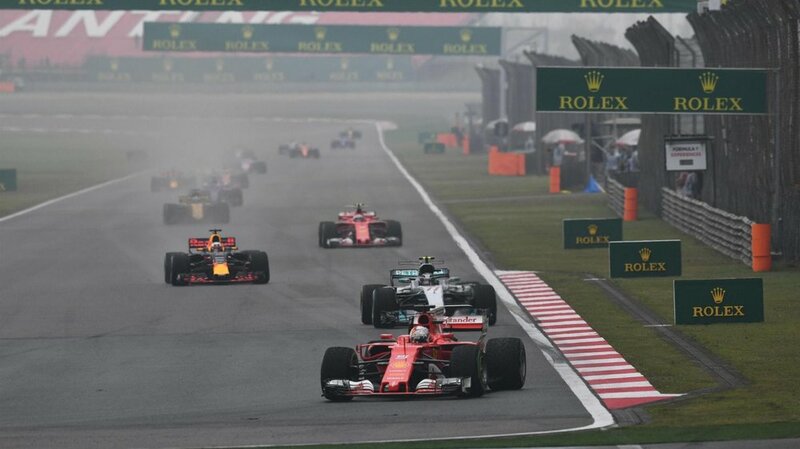 JT – Mercedes and Ferrari were again the main story at last weekend’s Chinese Grand Prix in Shanghai. This time Mercedes gained the upper hand with Lewis Hamilton dominating the weekend, earning pole position and leading from the start without ever being challenged. Meanwhile Sebastian Vettel had to fight his way to a second place finish. The race began on a damp track with nearly all of the field on wet weather tires. Vettel gambled, pitting for slicks on Lap 2 during a virtual safety car period. Leaders Hamilton, Valterri Bottas, Daniel Ricciardo, Kimi Raikkonen and Max Verstappen remained on track. They reaped a reward on Lap 5 when Sauber’s Antonio Giovanazzi crashed exiting the final corner, bringing out a safety car. The leaders then pitted and emerged in front of Vettel. Mired in sixth place Vettel worked for several laps to pass Ferrari teammate Kimi Raikkonen. Then he tracked down and passed Ricciardo, going outside the Red Bull Racing driver in Turn 6. Verstappen fell to Vettel’s charge on lap 28 after locking up entering Turn 14. Vettel’s climb back to second provided some drama as did the performance of the Red Bulls on supersoft Pirellis early on. There was more passing at Shanghai - mostly on its long straights with DRS enabling some competitors to blow by those ahead. But the most interesting passing was pulled off in the corners. What did you think of the Chinese Grand Prix? SJ – The race showed again that there isn’t much between Mercedes and Ferrari. So far the battle between the two is shaping up to be pretty good. Hopefully Raikkonen and Bottas will step it up and be able to challenge for wins too as we get further into the season. No one really challenged Lewis at any point in China. There was more passing than we saw in Melbourne and it’s interesting because most of the really good passes were almost all two-lane overtakes. That’s something we touched on before the season began. I mentioned that one possibility resulting from the increased grip of the 2017 cars might be the capability to run more than one line through corners. That seems to be what happened at Shanghai. In the double right-hander that follows the start/finish line there was passing on the outside and the same in Turn 6. The pass that Vettel made on Ricciardo was spectacular and good fun to watch. But that can only happen at a track where you have extremely long corners, where you’re loading up the car for a long period of time. You’re not going to be able to do that in a traditional corner or a 90-degree corner. At the next race at Bahrain there just aren’t the type of corners that will encourage that kind of passing because one corner follows another pretty quickly. It’s unlikely. JT – What do you think of the performance of Valterri Bottas and Kimi Raikkonen so far? SJ – Bottas made a mistake in China, no question. But in fairness anyone can do that at some stage, they were tricky circumstances. He’s on the pace or very close it seems, the only difference is that Ferrari is much closer this year, hence the split on grid positions instead of the usual Mercedes 1-2. He certainly did a good job in Melbourne. I’m sure he’ll improve as the season goes on. I don’t think he’ll beat Lewis but I think he’ll be very close. It’s harder to say how Kimi will do. It seems difficult for him to have everything come together at once in recent years. He’s quick and then when it really matters there’s always some little thing that trips him up, sometimes it’s just bad luck but it seems to happen to him more than it does with Vettel for sure. Time will tell. JT – While Ferrari and Mercedes top the field, Red Bull Racing falls into a gap some distance behind them but well ahead of the rest of the teams. What do you make of their situation? SJ – It’s a bit disappointing - for them at least. I think everyone expected more from Red Bull with the changes in the rules. They’ve obviously missed the mark somewhere. They clearly don’t have the speed or downforce to match the Ferrari or the Mercedes on a consistent basis at least. I don’t think the Renault engine is that far behind now but they seem to be lacking some performance in their overall package. Ricciardo and Verstappen are very close in terms of speed and they’re pushing but the car’s just not there yet. However, with the crazy development curve in F1 I am sure they will eventually be on the same pace as the Mercedes and Ferrari. The Spanish GP seems to be the first race where all the big updates show up, so let’s see what happens after that. JT – Meanwhile the best of the rest of the teams are anywhere from 1 to 1.5 seconds off the pace of Mercedes and Ferrari, and the gap expands quickly as you go further into the field. If you’re not racing with Mercedes, Ferrari or possibly Red Bull, you’re miles off the pace. SJ – That was to be expected. Every time you have a significant rules change the teams without big resources are going to fall further back than they were before the changes took place. The way F1 is today it’s very difficult to come up with a great and different idea. The development on these cars pretty much comes down to cubic dollars, the more you spend the faster you will go. Every now and then someone gets lucky and get it right straight out of the box, but in the big picture it will take the mid-fielders and the back-markers probably another year or two before they’re able to claw back some time to the front runners. Then the gap will be around a second between those teams and the leaders. This happens every time we have a major rule change. JT – With rules stability costs should also fall a bit. This time around however one wonders whether the mid-field and back-marking teams can hang on financially until the situation stabilizes? There is work going on behind the scenes by the Liberty Media group to try to get teams to agree to reduce costs and spread F1 resources more equitably but will it actually happen? SJ – There’s been a lot of talk for a while now about cost reduction and how the money will be distributed among the teams going forward. I don’t think anyone really know how to go about the cost reduction issue at the moment, mainly because there are so many opinions on how to do this and to a large degree it comes back to what I’ve been saying for some time now. If you try to accomplish this in a democratic way, there will never be a good solution, a well thought out plan has to come from the top down and if the teams want to play they will have to follow these rules. As it is currently the teams can’t even decide where to have their meetings let alone come forward with any meaningful proposal on how to accomplish any form of cost reduction. The distribution of funds is another can of worms that could cause some serious problems going forward. I am sure the teams that are benefiting the most will not be willing to give up those benefits freely. This may end up being one of the biggest challenges for the new owners to untangle. JT – McLaren continues to have a pretty disastrous start to their 2017 season, having failed to finish with either car at Australia or China. Honda’s underdeveloped power unit is the biggest issue for them and it’s costing Fernando Alonso as he languishes in another uncompetitive car for yet another year. The upside is that there’s a silver lining for IndyCar and its fans. It was announced today that Alonso will skip the Monaco Grand Prix this year, choosing instead to drive one of Andretti Autosport’s Hondas in the 101st running of the Indy 500. This is big news for IndyCar and should be a massive boon for them. SJ – Yes, this is the best thing that could happen to IndyCar in my opinion. It’s funny, you and I have been talking about this in the blog over the last couple years – that IndyCar really needed to try and get one of the top guys in Formula One to come over and we always mentioned Alonso as a perfect example. This is really great news and I personally can’t wait to see him go around the Speedway, I’m very excited. It’s worked out that he’s the driver most likely to want to do this because he’s in an uncompetitive car again. It’s marketing gold and a huge shot in the arm for IndyCar. JT – That news must have been filtering through the paddock at the Grand Prix of Long Beach last weekend. It was another great event with some good racing, some foul luck for front-runners like Ryan Hunter Reay and Alexander Rossi, and another big dose of frustration for Scott Dixon. On the other hand, James Hinchcliffe managed to pull off a win for Schmidt Peterson Motorsports, one of the smaller teams in the series. He was followed home by Sebastian Bourdais in second place – the winner of the season-opener in St. Petersburg for Dale Coyne Racing - another of the series’ smallest outfits. Meanwhile Team Penske’s Josef Newgarden finished third. Scott finished fourth and it was obvious that he could have topped the podium if the team’s strategy had been different. They switched to a three-stop pit strategy during the race. SJ - Scott really should have won, again. He was far quicker than anyone else most of the weekend, just as he was at St. Petersburg. The team chose to go to a three-stop strategy because of the way they thought the yellow flag was going to fall early in the race. The yellow never came and it screwed his strategy completely. But as frustrating as IndyCar can be with their closed-pit rule during cautions, the racing is still very exciting and I still claim it’s the best racing out there of any major Championship, certainly better than anything else in single seater racing. The first two races show that almost everyone in the series has a chance of winning and the gap between the top teams and the smaller ones is very tight. It was frustrating for Scott to be on the wrong end of the stick again but that stuff usually evens out over the season. JT – You raced in the Grand Prix of Long Beach in CART from 1993-1996. What are your memories of racing there? SJ – I always enjoyed racing at Long Beach. The first race I did there, I think I qualified on the second row. But it didn’t turn out to be a particularly fond memory in the race because Mario Andretti put me into the wall at the hairpin before I even got to the start-finish line! They waved the green flag, we hit each other coming out of the hairpin and it was over before I even got to the flag! But Long Beach is a great event and it seems to get bigger each year, the crowd is great and the atmosphere is terrific. 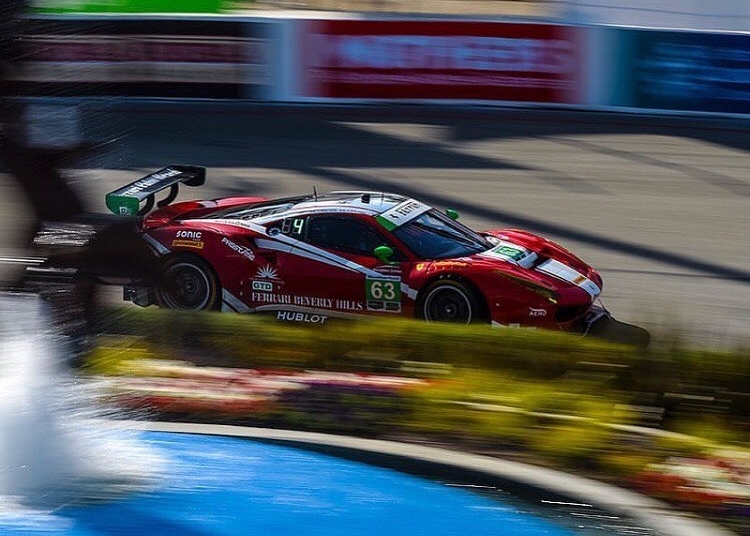 JT – Scuderia Corsa has a good finish in Saturday’s IMSA Sports Car Grand Prix at Long Beach. 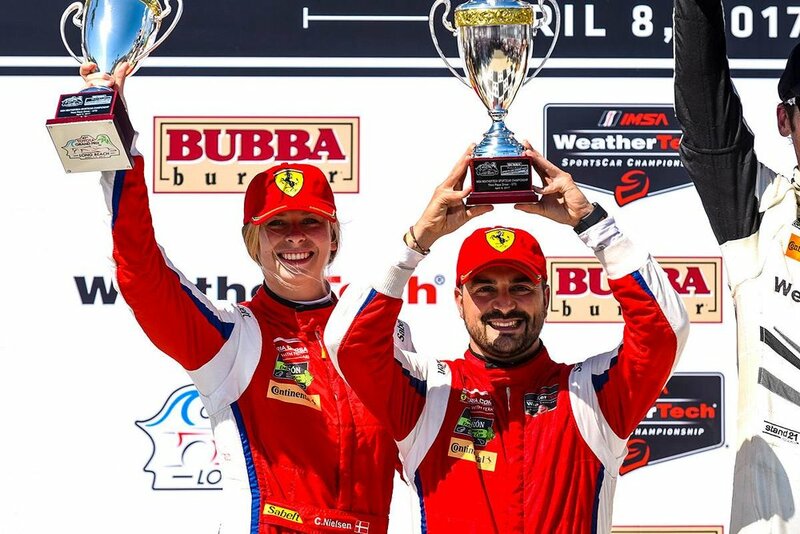 Christina Nielsen and Alessandro Balzan drove their Ferrari 488 GT3 to third place. SJ – Everybody did a great job. Christina did a great job starting the race and had a good stint. Balzan was very spectacular in his stint and showed some really good race craft. He passed a lot of cars toward the end of the race. He was driving hard and it was a good finish. And the team did their usual brilliant job on the strategy, we gained something like 5 places with the pit strategy we used. We have one of the best teams out there on the scoring stand. JT – In other news it appears that Felix Rosenqvist will make his debut at the 24 Hours of Le Mans this year with DragonSpeed Racing in their LMP2 Oreca 07 Gibson. He’ll share the car with Ben Hanley and Henrik Hedman. SJ – Yes, he tested the car for the first time this week in England and he really liked it. It will be a great experience for him to do Le Mans also. It’s a track every driver should experience, along with the Indianapolis Speedway. They are both iconic race tracks and still as difficult and dangerous to master as they have ever been.